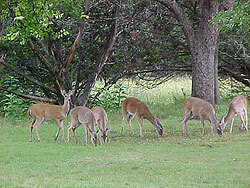 The wildlife of the Texas Hill Country is diverse. Regardless if you are a hunter, photographer or just a lover of wildlife and nature, the Hill Country offers ample opportunity to get in touch with nature’s creatures. You’ll find the following mammals in the region: badger, bats, ferret, jackrabbit, prairie dog, bobcat, coyote, cottontail feral hog, fox squirrel, Mexican ground squirrel, Mountain lion, Mountain sheep, armadillo, opossum, raccoon, skunk, lots of white tailed deer and there are also numerous bird species that frequent or are native to the Texas Hill Country. Approximately 300 species of birds occur in the Texas Hill Country where birding is great all year. The area is an overlap zone of ranges of eastern and western bird species, as well as some north and south species. An excellent place to view birds in Fredericksburg proper is the Live Oak Wilderness Nature Trail in Lady Bird Johnson Municipal Park. located just 7 miles east of Fredericksburg. One of the nation’s large working wildflower farms. Flowers bloom from spring through the first frost. Shop in the Market Center, have a drink in the Brew-Bonnet Biergarten. Don’t miss the 3,000 square foot butterfly haus, featuring Texas native butterflies. 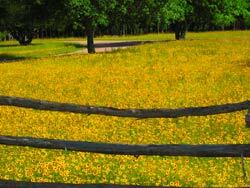 Includes 10 counties in the Texas Hill Country – beautiful wildflowers including the Texas Bluebonnet. For a nice break from all of the nature that the Texas Hill Country offers don’t forget to check out some of the local Fredericksburg wineries. The Fredericksburg area of the Texas Hill Country is home to many native and exotic species of animals, which allow sportsmen almost year round hunting opportunities. White tail deer are the most popular and plentiful, but there are also turkey, doves and quail. A brochure is available through the Fredericksburg Chamber of Commerce 830 997-6523.